updates in your websites or blogs. The Webnexs wticker is a HTML ticker which displays news Headlines, updates social media post and many more in your Website/Blog for 100% free of Cost. wticker follows Google SEO Rules and provides quick updates with super fast page loading speed. Webnexs wticker allows you to customize styles and appearance. Modify the color, position, direction and changing speed easily. wticker is 100% free to use and modify. There is no hidden cost and no back links or water mark. Webenxs wticker supports multi languages like English, Arabic, German, Spanish, Italian, Turkish, Chinese, Japanese and many more. 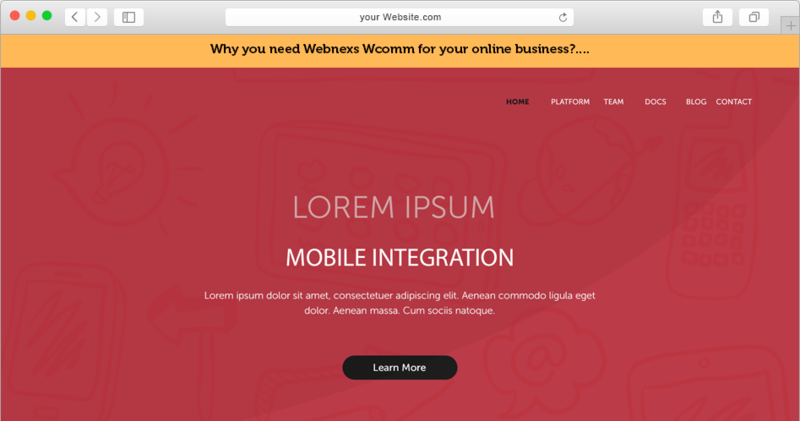 Integrate your own Webnexs wticker easily. Just Download, Install and start updating your news and updates on your wticker today. Pasted code snippet loads Webnexs wticker directly into your website/blog without blocking the parsing/loading of your web page. we did a great job with these companies. You can be next to work with us. 100+ Successful Customers Can't be Wrong. Ultimately It’s the customer Service and their feedback is important to us. Starting with simple Contact Over mail, we Opened up our Support to any complex Solution needed. Look at what they speak about us . I have to accept that your ecommerce website service is great. Our team says that its very very easy to use and understand as you have developed a user friendly design for us. We have challenged them with a complicated car based website design idea but you have made it reality. Big thanks to your support team as they have answered all my questions without any hesitation. Thank you so much.